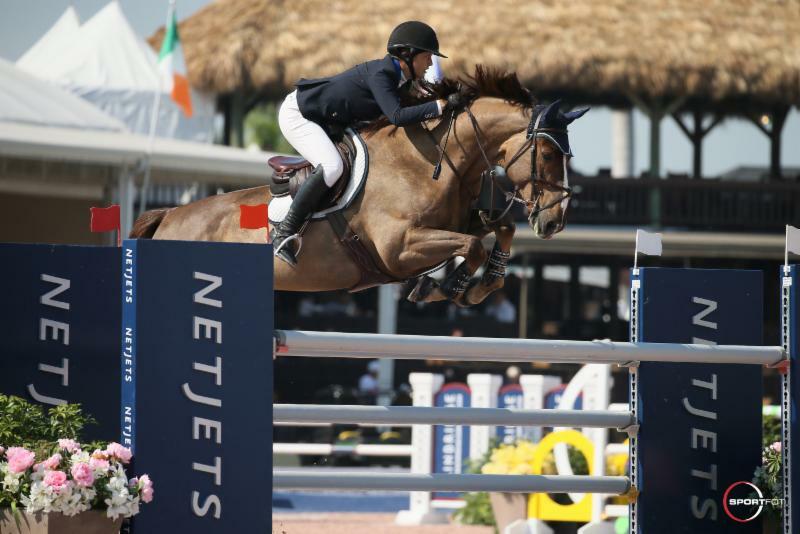 The second week of 2019 Winter Equestrian Festival (WEF) is well underway at the Palm Beach International Equestrian Center (PBIEC) in Wellington, FL, with a win for 18-year-old Mckayla Langmeier of East Granby, CT, riding Bon Vivant in the $6,000 Bainbridge 1.40M speed class on Friday, January 18. WEF will be host to a variety of FEI CSI2* jumper classes this week, along with top hunter competition. The highlight of the week will be the $72,000 NetJets Grand Prix CSI 2* during “Saturday Night Lights” this Saturday, January 19, at 7 p.m. in the international Arena. Langmeier and her eight-year-old gelding Bon Vivant (Bustique x Doris Day V Overis Z), competed in the high junior jumpers last year and decided to test the waters in their first FEI class this afternoon. Her goal was to have a fast and competitive ride and she did just that. The pair went towards the end of the line-up, putting in a fast and clear round of 58.77 seconds to top the class. They will compete later in the week in the $36,000 CaptiveOne 1.45m Classic on Sunday and hope to continue at this level throughout circuit. Mckayla is known for a successful junior career and is now a freshman at Auburn University and a part of their NCAA Division 1 equestrian team. Although she is riding in her first year as an amateur, Langmeier regularly competes against the top professionals in the world. “It’s still really exciting to come out here against these top riders and do so well,” she said. Andrew Kocher (USA) aboard the eight-year-old mare Abelone O.T Lowlands Z (Andiamo Z x Dawn O.T. Lowlands Z) came in a close second by only 0.09 seconds. They went early in the order and maintained their lead for the entirety of the class until Langmeier and Bon Vivant put in their effort. Third place went to Kelli Cruciotti (USA) riding 3 Seas, LLC’s Grandy De Laubry (Chin Chin x Cerimpta De Laubry) with only a 0.11 second difference between her and Kocher.